We were in deep. A part of South Tyrol never explored before. Well, at least not by us. The excitement of encountering the unknown volted through our hearts. What treasures would we find in this land bejeweled with stone, pine and pasture? We didn’t have to wait long to find out. As our car ascended a road cut through a swath of evergreens, we emerged into an opening where grass ran in waves up a hill beyond our eyes. On the other side of the road, the green tide tumbled into another forested enclave. From its heart rose a watchtower wearing centuries of medieval scorn. Further up the hillside stood another tower — an even more time-worn relic in an eternal state of crumble. Beyond this castled scene, the chiseled peaks of the Dolomites thundered on the horizon. Naturally, we stopped the car to absorb the sight. Falling in love with this part of South Tyrol was going to be easy. That much we knew already. What we didn’t know was just how much it was going to feel like home. We crested the castle hill and began a slow descent into a valley that stretched ever wider with farmland. Trees once lining the road were now relegated to the edges of forest-clad slopes. The occasional church spire reached up from huddles of rustic chalets dotting the rolling landscape. Were we traveling through a postcard? The abundance of idyllic country scenery left no doubt the Casies Valley is a rustic pearl within South Tyrol’s wondrous Puster Valley. Our expectation for a few days of Alpine enchantment at its award-winning Hotel Quelle Nature Spa Resort grew with each passing moment. As we came up on the village of Santa Maddalena, we saw dozens of red and violet geraniums swaying from the balconies of Hotel Quelle. They were indeed waving at us to exit the road. After being in the car for more than an hour, we were anxious to get settled. But before walking into the hotel foyer, we paused to inhale the pure mountain air and our new surroundings. Hotel Quelle’s alluring charm extended well beyond its flower-draped balconies. The landscaping carried us to a simpler time. Amid rows of flower beds, a mountain creek rippled rhythmically through a weathered water mill wheel. Nearby, two antique tractors in nostalgic pose added their colorful touch to the rural setting. Along the walkway, a wooden wayside shrine cradled by pink flowers offered its blessings to those who noticed. Inside, the hotel’s warm embrace began before we even encountered a soul. At the foot of a spiral staircase leading to the reception area, we admired wood carvings of a man and woman arising from tree trunks reaching out for one another. Artful honeycombed lights hanging above radiated their form with a candlelight glow. Etchings of the word “Welcome” in various languages staggered up the stairwell wall. Rich tones of Alpine wood wrapped around us at the top of the stairs. Every corner of the hotel exuded a mountain lodge ambiance with just the right touches of elegance. We loved it. Clearly, the boundless natural beauty of the valley inspired Hotel Quelle to create an equally gorgeous resort. mountains loomed over the resort offering us breathtaking beauty at a moment’s whim. The soothing sound of a rushing waterfall not far away promised us the most restful sleep in ages. We walked over to the front desk where Hotel Quelle’s manager, Manuel Steinmair, met us with a kind smile. He invited us to relax in a cozy lounge area while our luggage was brought to our room. Relaxing here was not going to be a problem. In the middle of the room under a luxuriant chandelier was a grand floral arrangement bursting with the colors of autumn. The wooing flames of a fireplace enticed us to sink deep into our chairs. The hotel’s maestro of bar-born wonders, Stefan, brought over a glass of Lagrein, a German pale lager and an early evening appetizer. While sipping and savoring, we browsed a daily guest newsletter given to us by Manuel. On the cover was a quote: “Your mind believes what you tell it, so tell it positive things.” Do negative thoughts surface in such a charming place? We were already positively certain they do not, but appreciated the inspirational reminder anyway. The newsletter provided the weather forecast, the day’s culinary delights, evening entertainment as well as available spa experiences and guided outdoor excursions. With 48 attractions awaiting us including 7 pools, 10 saunas, a Vital Garden and the vast wilderness of the Alps just outside the door, we were thankful to receive recommendations. Upon finishing our drinks, we were greeted by Lisa whose charisma glowed as warmly as the fireplace. She wore an adorable dirndl befitting the hotel’s Alpine character. We followed her to our room through hallways adorned with traditional Tyrolean accents. Every attempt she made to point out the resort’s amenities along the way proved futile. Our attention kept wandering from one lovely decor piece to the next. Our room was called the “Romantic Fire” suite. One step inside and it was easy to see why. Stylish Alpine detail, relaxed furnishings, soft mood lighting, minibar and a crackling virtual fireplace gave the room an air of refined intimacy. From the balcony, mountains loomed over the resort offering us breathtaking beauty at a moment’s whim. The soothing sound of a rushing waterfall not far away promised us the most restful sleep in ages. Nearby, a private hot tub tempted us, but dinner time was approaching so we resisted its pull until later in the evening. We walked back into the room and found our luggage sitting neatly in the room’s closet. Our jackets from our car were hung for us and even items we previously purchased on our trip cordially set out. All we had to do was change into our evening attire. Dining at Hotel Quelle we found isn’t so much an event, but a journey. Each night, Hotel Quelle’s chefs and wait staff greeted us as if joining them in their own home. The joy they took in guiding our senses through delectable Alpine and Italian gourmet cuisine was infectious throughout our stay. The tables swooned with romance. Elegant settings paired with swaying candle flames and soft music encouraged whispering nothing but sweet nothings every evening. We began each night by speaking with Hotel Quelle’s resident sommelier, Akos Joo. His wine knowledge was astonishing. With 10,000 bottles in the hotel’s wine cellar, Akos’s advice in making a selection was invaluable. Plus, every time we spoke with him we came away a little wiser about wine. When we requested he surprise us with a white from Elena Walch, a wonderful winery we had previously visited, he returned with their “Beyond the Clouds”. We could not have been happier. It was a bottle we had been wanting to try for quite some time. The hotel’s salad buffet was like discovering a bounty of fresh goodness from the forests, gardens and pastures of the local area. The soup of the day was also always a pleasant surprise. We delighted in unfamiliar flavors of crayfish, oxtail and liver dumplings. Yes, it’s possible to delight in liver. The second courses were masterfully prepared and so artistically presented that it almost seemed wrong to disturb them with a fork. Flashes of creativity were apparent in every dish. We’ve savored knödel dishes throughout South Tyrol, but the wonder Hotel Quelle set before us was particularly rich and delicious. The drizzled Gorgonzola perfectly infused a creamy, tangy Italian touch into a hearty Tyrolean favorite that was nicely offset by the juicy kiss of the glazed grapes. For us, deciding between South Tyrolean or Italian cuisine was too challenging so we took turns. One of our favorites was South Tyrolean potato ravioli stuffed with rosemary ham on asparagus and “Bozner” sauce. Bozner sauce we learned is the kind of down-home kitchen magic South Tyrolean grandmas know by heart. It’s a delicious local delicacy made with eggs, mustard, salt, pepper, chives and butter. After the second course, we faced even more challenging menu choices. Each night Hotel Quelle prepared four main course options. Two of which were meat dishes such as Black Angus steak, rack of lamb, pork, veal and duck breast. Seafood and vegetarian dishes like grilled king prawns and potato pumpkin stew comprised the other two. We both tried the meat, seafood and vegetarian dishes and found them all to be heavenly from the first bite to last. But the one whose flavors stole our hearts was the South Tyrolean spinach dumplings (also known as spinatknödel) with Gorgonzola sauce and glazed grapes. By the time we made it to dessert each night, we gave each other a look of concern. Could we possibly still have room? But our worries melted away whenever we saw the scrumptious delights waiting for us. After enjoying so much amazing food, it would have been just wrong to walk away from the table before the finish line. So we stepped up to the plate so to speak and never regretted it. One lavish treat we both cherished was actually a first for us. Buchteln is a marmalade-filled pastry of the sweetest order. 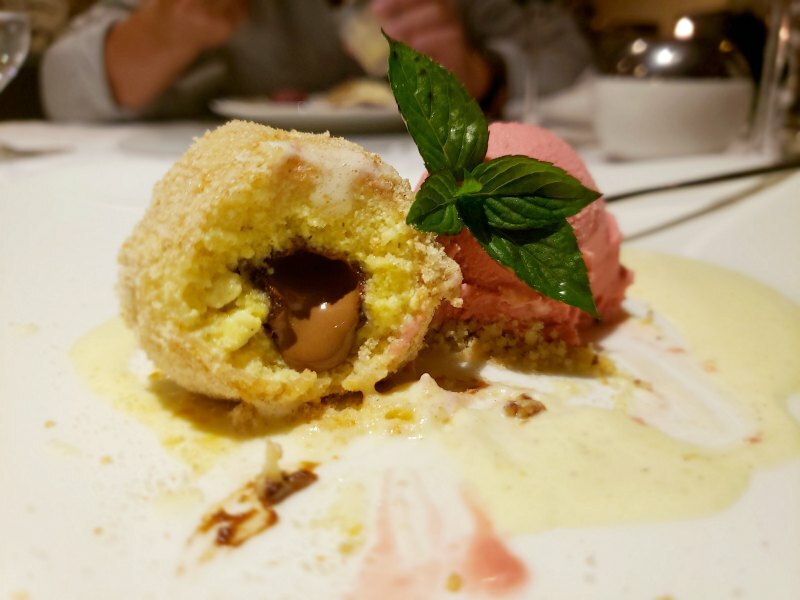 This traditional South Tyrolean concoction was served to us with a vanilla sauce that we could not get enough of. The deliciousness of our evenings continued each morning with a plentiful breakfast buffet flush with fresh pastries and breads, homemade jams, local cheeses and meats, berries and juices. As if that wasn’t enough, tasty made to order dishes were also whipped up in an open-air kitchen. One doesn’t realize how spellbinding water can be until its curative powers are at the heart of your surroundings. Our first morning at Hotel Quelle began the same way our first night ended: relaxing in the hot tub on our balcony. Afterward, we ate a quick breakfast and decided to walk the property. We ventured out of our room to seek out the waterfall whose symphonic splashes sang us sleepy melodies all night. A rushing mountain stream nearby offered us a pretty good clue. We followed the morning sun bursting off its surface and were soon at the foot of a wide waterfall. Further up we could see two more sending a cascade of Alpine purity from some distant peak. Near the stream, we could hear a slight, gentle clang of cowbells coming from over a hill. We were not about to miss a chance to befriend cows in this fairytale land so we raced up into a meadow that yawned into the mountainside. A small gathering of cows grazed unmoved by our enthusiasm. Beyond them, the valley stretched for miles until revealing the stony summits of the Dolomites. We lingered admiring the idyllic scenery for a bit then strolled down the hill back to Hotel Quelle. Our next walking adventure was in the Vital Garden. Here, we went barefoot on a winding Kneipp path. This unique hydrotherapy treatment originated in the 19th century thanks to the naturopathic research of Sebastian Kneipp, a Bavarian priest. The treatment involves walking over pebbles and stepping into shallow baths of alpine water. The stones massage the soles of your feet while the swings between cold and heat improve blood circulation in the legs. We found it a fascinating way to harness the mountain. After a couple of times around the Kneipp path, we spent the rest of the morning lounging poolside simply letting the sun’s rays caress our skin. No matter where we were in Hotel Quelle’s outdoor oasis of wellness, the soothing sound of water fell all around us. One doesn’t realize how spellbinding water can be until its curative powers are at the heart of your surroundings. Kate taking a spin around Hotel Quelle’s Kneipp path. The afternoon began with a trip to the lunch buffet. We were not all that hungry yet, but the aromas emanating from the kitchen were too enticing to ignore. Besides, when you feel like a guest in someone’s home, it’s just plain rude to turn down a meal. Despite the appetizing spread, we made our time at the table short. Showing up late for a spa appointment is an even greater sin than skipping a meal in our book. When selecting massages the previous day, we must have been going through sugar withdrawal. We browsed 20+ available massages, but settled on a back massage with South Tyrolean honey and a full body hot chocolate massage. Both were as sweet as they sound. Simply laying in the massage rooms would have been enough to induce a deep state of relaxation. Warm wood walls gently lit by a Himalayan salt lamp summoned a calming Alpine spirit. A flower in full bloom graced our eyes while lying face down on the massage table. Once the masseuses began, our sense of calm transformed into something more. A deep peace. When we awoke to reality an hour later, we were glad our hiking excursion was not until the following day. Trekking in our trance-like state would have been like walking through molasses. Ensuring we took it easy the rest of the afternoon was made even easier by Hotel Quelle. A traditional bread baking demonstration was on the activities calendar. Watching bread bake was the exact speed we were looking for. The demonstration took place next to the hotel’s outdoor infinity sport pool. Just the sight of the sun glimmering off its cerulean water enlivened us a bit. We made plans for a dip immediately after our Tyrolean bread baking lesson. 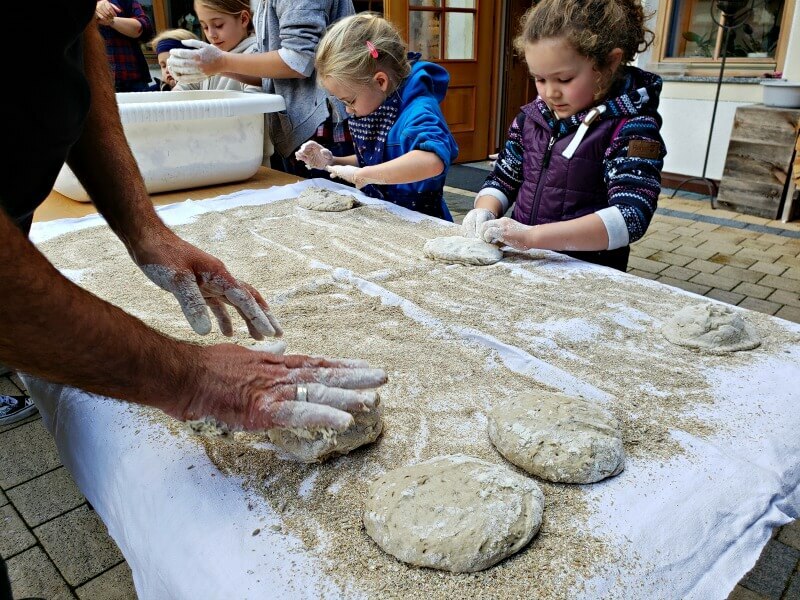 While making bread is a simple joy itself, the real fun was in watching youngsters roll and knead the sticky dough into semblances of loaves. The kids were transfixed by the whole process. We were too once the opening of the outdoor oven swallowed our creations. Medieval in size and manner, the oven had to be a former resident of one of the castles we passed on the way to the hotel. Behind the oven stood Hotel Quelle’s own chapel dedicated to the patron saint of travelers, St. Christopher. We wandered inside to marvel at this quaint adornment to the hotel grounds. The sun streamed through stained-glass windows bathing the interior in amber and blue hues. A magnificent iron cross hand-forged by a faithful soul hung above a worn wood altar. Left of the cross was an ornate statue of St. Christopher and to the right the Virgin Mary. While small, the careful craftsmanship evident throughout chapel matched the loving reverence found in any cathedral. Venturing into the infinity sport pool at Hotel Quelle is like making a grand entrance into a translucent ballroom. The pool begins indoors with steps leading down into the water. Two doors then slide open automatically when sensing your presence. The only thing missing is applause once you wade in! We spent our time in the pool leisurely lapping back and forth. The water temperature was just right. When needing a break we sat at the pool’s edge enjoying the quiet beauty of the chapel and a rustic mill tucked among flowers, evergreens and boulders born from the slopes beyond. After our time in the infinity pool, we explored the other pools and jacuzzis situated on the other end of the hotel. The views on this side were even more impressive. We could have sat all day in a jaccuzi facing the rugged mountain splendor under the spell of the late afternoon sun. It was hard to imagine a more perfect Alpine scene. But on the following day, Hotel Quelle made sure we found it. Our third day began with another soak in our room’s hot tub. Clearly, a morning ritual was taking shape. After another hearty breakfast, we met a handful of other guests in the reception area to elevate our Alps experience…literally. Sitting atop a mountain high above Hotel Quelle is the resort’s own chalet called Uwald. Each week the hotel’s guides, Barbara and Luca, lead hikes to this rustic gem perched at 6,700 feet. 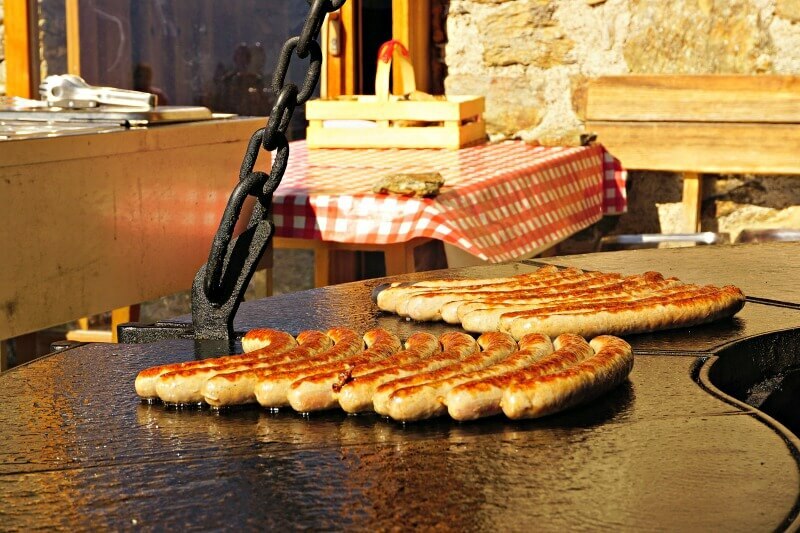 Beyond enjoying jaw-dropping views, guests are also treated to a traditional South Tyrolean meal prepared in the open. The genuine hospitality, novel amenities, abundance of activities and warm ambiance of Hotel Quelle fosters a feeling of belonging that is rare in our experience. We all hopped in a transport van that dropped us off at the trailhead in Santa Maddalena village near Hotel Quelle. Luca gave instructions for the hike to the group in German and Italian. As we set off up the path, he thoughtfully came over to us and shared the details in English. On both sides of the path, we adored green pastures sprinkled with wildflowers and cows basking in the sunlight. Farmsteads in perfect postcard poses greeted us. They looked peaceful and motionless from afar, but as we approached, the hard work of making a living off the land became ever more evident. Stacks of wood and feed framed by tractor tracks tunneling into the mud told tales of South Tyrolean sweat and toil. Winter was coming. Stands of pine and larch eventually overcame the verdant greenery as we began winding up the mountainside. The sun’s rays fragmenting through the canopy no longer warded off the morning chill. That was fine by us. The steepening trail kicked on our own furnaces. Catching a cool breeze was now welcome. We chatted with a few other guests along the way. For many, Hotel Quelle was their destination of choice each year. This didn’t come as a surprise. The genuine hospitality, novel amenities, abundance of activities and warm ambiance of Hotel Quelle fosters a feeling of belonging that is rare in our experience. Over an hour into the hike, we paused to let a mountain biker pass and catch our breath. A clearing in the trees offered up all of Casies Valley below. 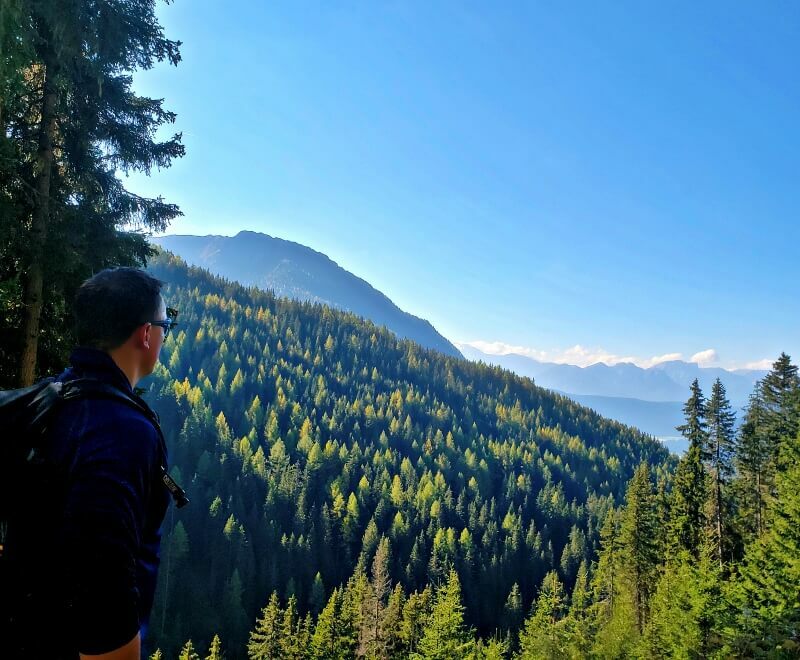 This was our kind of workout: totally immersed in a bird-sung forest with pure mountain air and epic views as the reward. As we continued our ascent, the trees began to thin out. An Alpine meadow gradually unfolded before us. The melodic clang of cowbells dinged ahead. We rounded a corner and met our hoofed musicians who kept their noses to the mountain. The merry band of moo grew as we arrived at the Uwald chalet. Luca was already tending to a large grill warming up under a fire. We took a seat on rocking wooden loungers with the other guests on a porch overlooking the cows and the valley. The peaks of the Dolomites tantalized in the distance. The stunning view held our gaze for more than a moment. But enchantment alone cannot quench thirst so we turned our attention to a pitcher of edelweiss-infused water. Its subtle sweetness did the trick. A man sporting a traditional Tyrolean hat and holding an accordion suddenly appeared at the edge of the Uwald. Where he came from we did not know. But looking back, we are certain he arose from the mountain itself as some sort of elemental gift to us weary hikers. His delightful playing during the duration of our visit inspired an even more jovial atmosphere. Savoring mountain views, meals and melodies at Hotel Quelle’s Uwald Chalet. The lunch we enjoyed inside the chalet was the perfect culinary companion to the hike. It consisted of grilled sausage, chicken, beef, potatoes, polenta and zucchini all washed down by ample amounts of Vernatsch. Afterward, we relaxed awhile longer on the loungers taking in the serene view and letting the mountain meal settle. Barbara soon came by with a big smile offering us a shot of help. She had a bottle of Schnapps in hand. We were reluctant at first, but she jokingly informed us that at these heights Schnapps is no longer alcohol, but medicine! Put that way how could we resist? Once our legs recovered for the adventure down, we hopped back on the trail towards Santa Maddalena. The descent was a feast for the eyes as we watched the valley swell with each step. When we reached our starting point, the afternoon sun was illuminating autumn’s full glory. Continuing trekking to the hotel instead of catching a ride in the transport van was the obvious choice. Back at Hotel Quelle, we decided to don our spa robes and explore the resort’s themed saunas and relaxation rooms. While reviewing the hotel newsletter earlier at breakfast, an upcoming sauna infusion noted as “Tropical” caught our attention. Hotel Quelle’s spa manager, Andrea, had previously mentioned that sauna infusions are a sensory experience not to miss. Alpine wellness comes in many forms. For some, it’s as simple as unwinding with eyes closed in a remote mountain setting. For others, it’s scaling a craggy cliff always one slip away from death. And for others still, it’s roasting in a blazing hot sauna inhaling steam from exotic healing oils and herbs with dozens of other naked people while loud music and clapping pulsate all around you. Sound intriguing? It is. Welcome to the sauna practice called “Aufguss” (German for “infusion”). The Tropical Aufguss we participated in at Hotel Quelle took place in their Infinity Show Sauna. We arrived a few minutes before the event and found the sauna nearly full with guests. We had no idea it would be so popular. As we squeezed in on a bench, the “Aufgussmeister” arrived wearing a bikini top with a flower lei and a grass skirt. The Beach Boys “Surfing in the USA” came on next followed by DJ Antoine’s “Ma Chérie” at which point everyone was clapping to the beat. By the time the show finished, we could barely see through the sweat beading down our foreheads. She closed the sauna door and explained to us in German and Italian the ritual she was about to perform. We ascertained that it involved setting snowballs infused with special oils from Madagascar on the sauna stove. We also caught that if the heat became too intense we were free to leave at any time. The Aufgussmeister then began to dance around the stove as the sound of maracas filled the sauna. We all recognized the song immediately and began to bounce to the 70s classic “In the Summertime” by Mungo Jerry. The Aufgussmeister released the snowballs on the stove directing the fragrant steam toward us with the rhythmic wave of towels and fans. With each of her gyrations around the stove, the heat intensified reaching 90+°C (194+°F). The Beach Boys “Surfing in the USA” came on next followed by DJ Antoine’s “Ma Chérie” at which point everyone was clapping to the beat. By the time the show finished, we could barely see through the sweat beading down our foreheads. 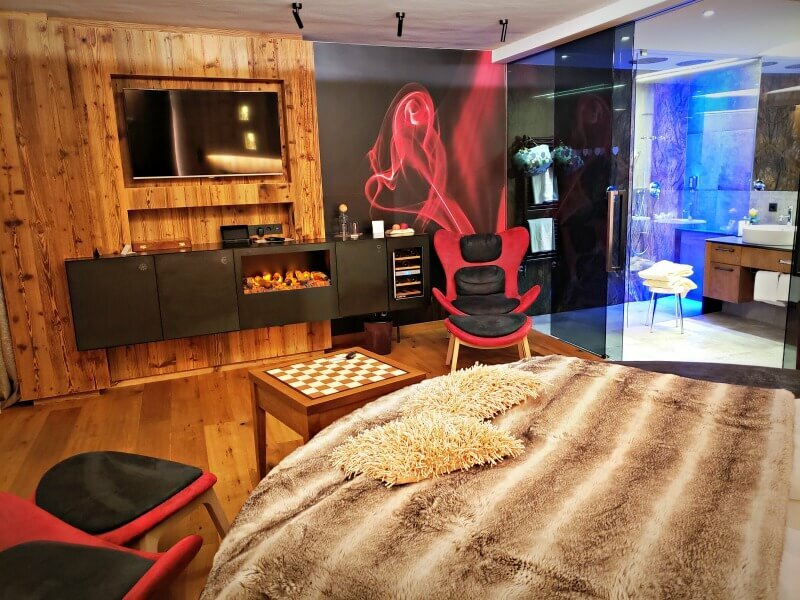 As recommended, we rinsed off in a shower outside the sauna and then darted into the Snow Sauna, a cooling sauna experience unlike any other in South Tyrol. Powdered snow and ice crystals enshrouded us from all sides. The temperature hovered around -10°C (14°F). We were in a posh ice cave that Ötzi the Iceman would have envied. Enduring such large swings from hot to cold produces health benefits, including boosting metabolism and promoting better blood circulation. We found the frigid blast rather enjoyable and recommend everyone try it while at Hotel Quelle. 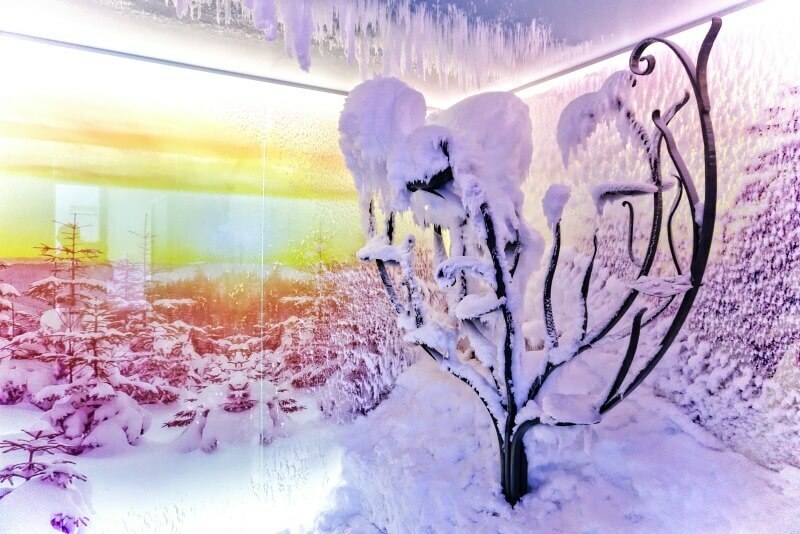 The Snow Sauna at Hotel Quelle is the first of its kind in South Tyrol. We wrapped up our sauna excursion by sitting in the Water Mill Sauna. As its name suggests, a wooden water mill is at the heart of the experience. It was quite comfortable at 65°C (149°F), allowing us to slowly soak in views of the pond in the Vital Garden and the surrounding mountains. Our last morning at Hotel Quelle came much too soon. We tried to slow the start to the day with another visit to the hot tub. If only we could pack our new morning ritual into our suitcase. The mountains outside our room seemed to have moved in closer overnight. The waterfalls more alive. Why is it that when you have to leave a place that has captured your heart it somehow becomes even cozier? The gods of travel like to play the cruelest tricks. We made our way to the breakfast buffet and took our time savoring every bite and sip. Glancing at the hotel newsletter, we saw that a festive celebration in traditional South Tyrolean fashion was taking place in the evening. We were going to miss it. Clearly, the gods were to be extra cruel on this day. We comforted ourselves with few a more krapfen to soften the sense of loss. After saying goodbye to Manuel and his team, we headed to our car with yellow rose in hand, a touching departing gift. A card caught our eye from under the rear window wiper. It bid us farewell stating that our windshield had been cleaned so that we may always see clearly for a safe journey back home. But we were not going home. Our next adventure in South Tyrol was going to be at the iconic and ever majestic Lake Braies. Exploring such a renowned natural treasure was the only worthy follow up to our stay at Hotel Quelle. 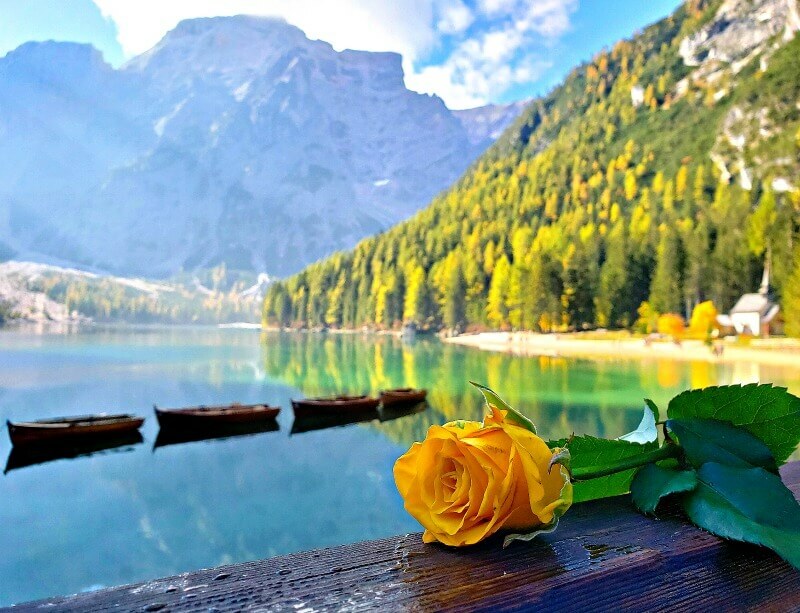 The yellow rose from Hotel Quelle joined us as we explored Lake Braies. We’d like to thank the Steinmair family and their entire team for making us feel so at home at Hotel Quelle! And we’d like to congratulate them on winning the 2019 Trivago Award as the best 5-star hotel in Italy! For more insight on how to enjoy Hotel Quelle to the fullest, check out our Hotel Quelle Tips page. Autumn’s first kiss. When you see it your heart sings a bit. The promise of the season lifts spirits. So when we began the drive up the mountainside to Preidlhof Hotel & Spa and found ourselves surrounded by vineyards and orchards hinting the colors of fall, we couldn’t help pulling over to wander a bit among its beauty. We crossed a creek shimmering in the early evening’s golden light and admired the rays dancing between seemingly endless rows of flowers. Further up we spotted palm trees towering like guardians over the fruitful landscape. A crenelated castle keep pointed toward a distant mountain with snow still clinging to its peak. One of many medieval wonders in this corner of heaven. No surprise really. A king would have to be mad not to covet such a land deeply held in a Mediterranean dream. Once back in our car we continued winding upward until rounding a final corner where Preidlhof’s elegant marquee welcomed us. One of the top 5-star hotels in Italy, Preidlhof is a family-owned, adults-only spa resort nestled on a lush slope on Sonnenberg mountain in Naturns, South Tyrol. It basks in 315 days of sunshine each year begifting couples an Eden-like setting for wellness and romance. Walking in, the hotel’s modern, opulent interior was instantly enamoring. A linear fireplace softly lit the reception area. Ambient lighting cast lavender and sapphire hues over the check-in counter. No matter where guests spend their time they are intimately immersed in nature. Preidlhof has taken every measure to imbue the elemental wonders of Earth to mend your mind, body and soul. Beyond the reception area, contemporary furniture and decor complemented the hotel’s sleekness. Many resorts overplay the “modern look” creating a cold, sterile vibe. However, Preidlhof is an exception. The first impression we had was every inch of the hotel masterfully uses state-of-the-art design to conjure a romantic mood and elevate your well-being. After checking in, we were invited to enjoy a drink and an aperitif on the hotel’s restaurant terrace. Unwinding with a glass of wine suited us just fine after spending the day in Brixen at its annual Bread & Strudel Market. We sat above the leafy peaks of an apple orchard next to an olive tree with a massive, contorted trunk. Even its twisted form looked relaxed here under the South Tyrolean sun. We sipped the wine and mountain views for a while before the “best butler in the world”, Davide, graced us with his presence. He kindly gave us a brief tour of the hotel. As he led us to our room, we inhaled sweet fragrances abounding from every nook and cranny. Just walking the hallways of Preidlhof is an engagement in aromatherapy. Our room enchanted as much as the lobby and lounge. The decor and lighting evoked a romantic aesthetic. Artful accents of pink and lavender brightened the room. On the terrace, a plush daybed waited for us to slip under a blanket and count the mountain crests beyond the valley floor. Above it was a warming lamp. Ah, romance made easy. We couldn’t wait to spend a candle-lit night sleeping under the stars. After situating ourselves, a long shower under tranquil blue lights with dual raindrop shower heads was too enticing to pass up. Next, we donned evening attire to dine in the hotel’s acclaimed restaurant….and perhaps enjoy another glass of wine or two while looking over a weekly resort program left conveniently in our room. Prior to arriving at Preidlhof, we read up on its restaurant. Gault Millau, a rating system used by fine food aficionados, awarded it two toques while Michelin awarded one star. Naturally, our expectations for culinary wizardry were quite high. Preidlhof did not disappoint. During our stay each dining experience was impeccable. From dish presentation to timing, service, size and flavor, the hotel’s restaurant ranks among the best we’ve visited in South Tyrol. Every evening was a feast. We enjoyed 7-course gourmet dinners with a recommended wine paired perfectly with the night’s menu. Whenever possible we try the local wine when eating out. On our first night we ordered a bottle of Müller Thurgau, a delightfully complex white from Castel Juval. Castel Juval is a winery located on a mountain just west of Preidlhof. Its name comes from the castle that legendary mountaineer, Reinhold Messner, calls home. We didn’t finish the bottle at dinner but found it chilling at our table the following night. A pleasant surprise. Considerate touches such as this were common throughout our stay. 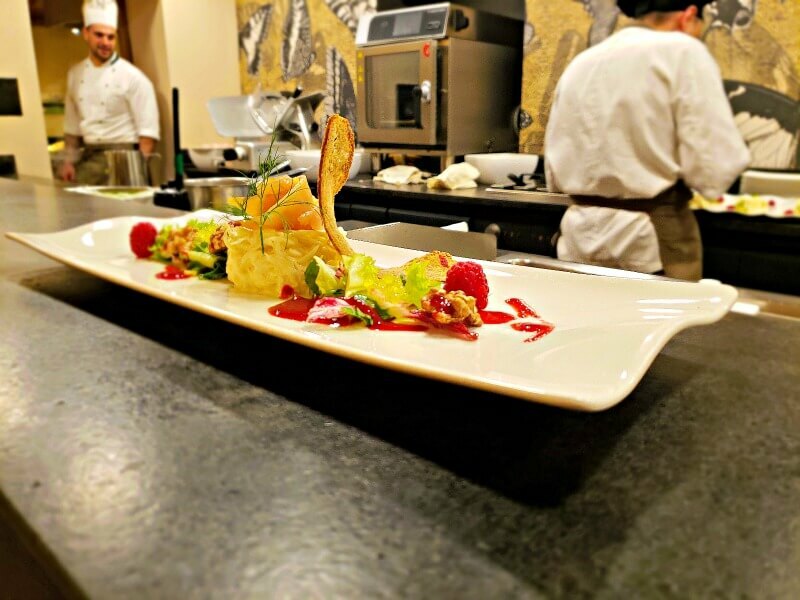 Preidlhof supports local South Tyrolean farmers and producers by incorporating their finest offerings in each dish. We could taste the love for the land in every bite. So much of what we ate was delightful, but the venison braised in Lagrein with cranberries, pumpkin risotto with glazed chestnuts, potato cream soup and carrot cream soup stood out as our favorites. The desserts that brought the evening’s dining experience to a close were divine. Creatively prepared and presented, they intermingled sweet flavors in novel ways without overwhelming richness. From 7-course dinners to gourmet buffets, Preidlhof uses the finest ingredients from local South Tyrol farmers and providers to ensure authentic farm-to-table dining experiences. The dining staff made our evenings even more satisfying. Matthias, the hotel’s sommelier, ensured our wine selections met expectations each night. His lighthearted demeanor was a constant joy. At one point he saw us snapping pictures of our dinner fare. He stopped by our table and jokingly threatened us with a copyright violation. He was certain Preidlhof copyrights each dish! Matthias also astutely explained the difference between Lagrein and Vernatsch (also called Schiava): “When you reach the mountain hut after a long hike and want to make the hike down, order Vernatsch. If you choose Lagrein, you better hope there’s a cable car to bring you back.” Wine wisdom none should ignore. The following morning we enjoyed a delicious gourmet breakfast buffet. Practically every fruit, bread, pastry, Alpine cheese, homemade jam and honey one could fancy was for the tempting. Chefs were also on hand to make fresh egg dishes on the spot in an open show kitchen. Clearly, the toughest decisions guests face each day is at this buffet. We would have lingered longer to savor more of the morning spread if we didn’t have a tour scheduled of Preidlhof’s celebrated Spa Tower with Michael, the saunameister. Calming sounds, melodies and vibrations swirled in symphonic unison pulling us deep into a journey where the mind was our guide. The sensory immersion was stunning. Michael warmly met us with a big smile. His passion for wellness was immediately evident. He led us up through each of the Spa Tower’s six floors and explained how its saunas, relaxation rooms, lounge areas, jacuzzis and pools inspire unique ways to enliven your well-being. We came away impressed by Preidlhof’s keen sense for thoughtful design. No matter where guests spend their time they are intimately immersed in nature. From floor-to-ceiling windows offering peaceful panoramic views to fragrant woods, oils, fruits and herbs to terraces where pure Alpine air nourishes your senses and the sun washes away worry, Preidlhof has taken every measure to imbue the elemental wonders of Earth to mend your mind, body and soul. The number of possibilities to rest and rejuvenate in Preidlhof’s Spa Tower was dazzling. We were anxious to slip into the spa robes and sandals provided and begin. As recommended by Michael, we began on the first floor in the Wine Sauna. It offers a one-of-a-kind experience that emulates sitting in a bricked-wall wine cellar. Crimson lighting, soft as velvet, and enticing aromas of wine washed over us as we sat in silence. With a temperature of 70° C (158° F) and a humidity level of 35%, the sauna nicely balanced comfort with heat. After 20 minutes or so we left the Wine Sauna and rinsed in a nearby shower before moving to the Steam Bath room. In the center of the room, a salt crystal emanated light into the misty room, creating a trippy ambiance. We half expected to look through the billowing haze and see Jim Morrison sitting across from us. Turkish-influenced, the Steam Bath infuses brine with steam to promote healthier breathing. Preidlhof’s Deep Sea Relaxation Room is a spa experience unlike any other. Next, we opted to take a break from the heat and relax in Preidlhof’s latest addition to the Spa Tower — the Deep Sea Relaxation Room. Designed by Daniel Lathan, a pioneer in audio and light, and touted as the future of relaxation, the room offers two programs. It was unlike anything we have ever experienced. We selected the deep sea experience first and laid back on two beanbag loungers. Soon thousands of LED lights illuminated in infinite waves all around us. Calming sounds, melodies and vibrations swirled in symphonic unison pulling us deep into a journey where the mind was our guide. The sensory immersion was stunning. After roughly 15-minutes the experience finished. We quickly checked to see if anyone was waiting outside to use the room next. We were in luck. The second program, “Nebula”, was even more fascinating. Instead of the depths of the ocean, it took us across space and time to the far reaches of the cosmos. Swimming across oceans and deep space travel made us a bit hungry and thirsty so we wandered over to the Spa Tower’s Vitamin Lounge for some refreshments. We snacked on a handful of fruits, nuts, speck and cheese and washed them down with a couple of glasses of herb-infused water. The Vitamin Lounge is another thoughtful touch for guests that we appreciated. At the other end of the Vitamin Lounge is the Salt Lounge. Since it was nearby and empty we decided to take a seat. Our timing must have been just right because on other visits the room was full. We laid back on large loungers inhaling the fine mist from the glowing salt walls. Built-in infrared lamps lasered radiant heat over our spinal cords. The warmth summoned soothing sensations making it clear why the room is so popular. Relaxing on the Spa Tower rooftop after taking a dip in the infinity sky pool. Fully reinvigorated, we marched to the rooftop for a dip in the Spa Tower’s infinity sky pool. An autumn breeze put a slight chill in the air. We didn’t waste any time making a splash. The warm salty water of the pool wrapped around us like a blanket. A lovely reprieve from the mountain’s frosty breath. Soothing oils caressed our skin allowing the polished gemstones to gently sail the contours of our bodies. Tranquil sensations of warmth and cold massaged one muscle end to the other. Pacifying tensions one by one. We waded to the pool’s edge and in stillness admired the Ortler Alps beyond the vast expanse of Val Venosta / Vinschgau Valley. The Ortler range is the highest in South Tyrol and likely once the stomping grounds of Ötzi, Bolzano’s most celebrated resident. With such stunning views, not coming up here under a moonlit night would be an insult to the annals of romance. We promised ourselves to return to the sky pool later that evening. After rinsing away the salt water and slipping back into our robes again we laid down on a rooftop bed for a while before continuing our sauna adventure in the Olive Sauna. This was, without a doubt, our favorite sauna experience. The smell upon entering it is one of the most pleasing aromas one could ever encounter. The warm richness of olive wood was heavenly. And at a temperature of 60° C (140° F) with a humidity level of 40% it was perfectly tuned to allow long sessions of gazing over apple orchards and the land’s other Mediterranean blessings. Preidlhof’s Olive Sauna is a blissful treat for your senses. Once the Olive Sauna thoroughly worked its meditative magic we ducked into an adjacent shower zone for another rinse. If you like long showers, you’ll want to linger here. We stood under a raindrop shower head where warm water was not its only gift. Lavish scents of mango and eucalyptus also rained down. The freshness was exhilarating. We wondered how to bring such an aromatic treasure into our home. Next, we thought a seat in one of the Spa Tower’s relaxation rooms was due. The cozy Fire Lounge bestowed more dreamlike views, but we let the hypnotic dance of fireplace flames hold our gaze until sleep took over. Our fire-induced nap was brief. The promise of a gourmet lunch buffet was a persistent alarm clock. Funny how delectable cuisine tends to do that. We went back to our rooms to change even though Preidlhof allows guests to enjoy a casual lunch in their spa robes. With lunch and our Spa Tower adventure behind us, our next stop was the Preidlhof Med-Spa & Beauty Center. An award-winning wellness refuge, the number of treatments, massages and therapies available is remarkable and a touch overwhelming. We asked for help to decide what to partake in as a couple. Claudia Köllemann, Preidlhof’s Spa Director, suggested their Welch precious stone massage for two. We didn’t have previous experience with a stone massage so took her recommendation. The Welch precious stone massage is a unique spa treatment that brings together the benefits of classical massage with the natural healing properties of oils and gemstones. We entered a room softly-lit by candlelight. The masseuses, Annemarie and Walter, quietly gave instructions and politely left until we were lying face down on two massage tables. The 6 pools and 5 jacuzzis beautifully interwoven under palm, cypress, lemon, olive trees and fragrant flowers make lounging at Preidlhof a wellness treatment of its own. Our massages began with gentle and graceful movements, working up from our feet and legs to our back and eventually over our torso and neck. Soothing oils caressed our skin allowing the polished gemstones to gently sail the contours of our bodies. Tranquil sensations of warmth and cold massaged one muscle end to the other. Pacifying tensions one by one. Seemingly floating around our tables, the masseuses silent, ritualistic manners subdued our busy minds. We both fell into a deep state of relaxation under the spell of songs by Enya and Laura McKennitt. When the massage ended more than an hour later leaving wasn’t easy. Breaking our state of relaxation seemed like a sin. Preidlhof had already won our hearts. Now it had won our minds. We left the Med-Spa & Beauty Center and were tempted to embark on a hike through the vineyards and orchards nearby, but decided to explore the immaculate gardens and pools of the property. As you’ll find, once at Preidlhof it’s hard to leave. The 6 pools and 5 jacuzzis beautifully interwoven under palm, cypress, lemon, olive trees and fragrant flowers make lounging a wellness treatment of its own. The waterscapes of Preidlhof radiate intimacy without ever feeling crowded. We thought the waterfall feature was especially beautiful as it reveals a hidden pool area through an arch. Next to this, we noticed a chance for another sweat in a sauna. The Schwarzbrenner Sauna is tucked into the stone walls of the waterfall. Whereas the Spa Tower saunas are sleek and elegant, the Schwarzbrenner is warmly rustic. Its cozy 60° C (140° F) temperature made it easy for us to sit for an extended time without needing a cool off. After our final sauna experience, we ventured to the resort’s indoor pool environment called “The 50th”. Walking in was like discovering Preidlhof’s best-kept secret. We had the whole area to ourselves. Eclectic lighting mingled with vintage imagery cultivating a captivating ambiance. We sat in the pool under linear fireplaces stretching over the water and plopped down on bed-sized swings. Across from the pool, futuristic relaxation pods built into the wall invited a moment of rest. We couldn’t resist. Inside was entrancing with the pool’s rippling water resonating around us. Ensuring a healthy whole body and mind connection to nature is important to us. 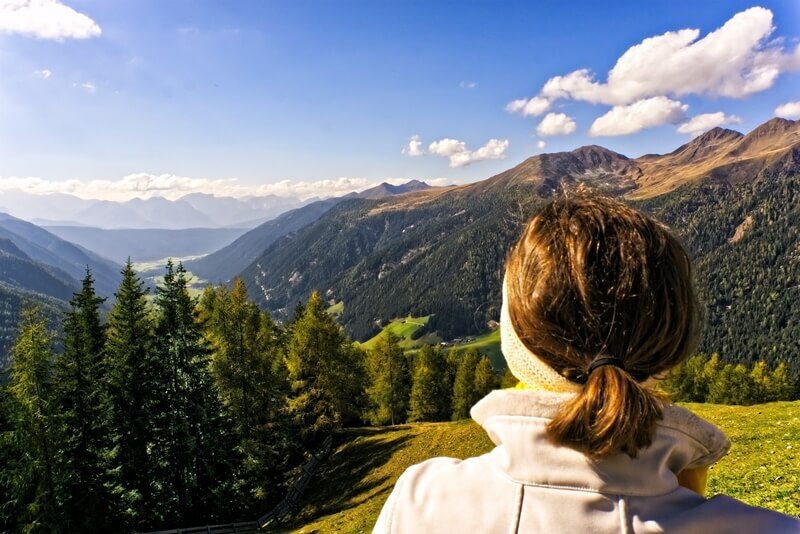 In fact, much of our passion for South Tyrol is due to all it offers in that respect. So when we learned of Preidlhof’s health evaluation offering using a holistic approach we were curious. The next morning we returned to the Med-Spa & Beauty Center. We met with resident health expert, Dr. Alexander Angerer, for a Heart Rate Variability (HRV) session. Using the latest in holistic diagnosis technology and software, he attached a measurement device to each wrist and instructed us to lie down on an examination bed and relax. And within five or so minutes we were reviewing results on a computer screen. He walked through conceptualizations of the findings, which measured our heart rate variability, nervous system health, energy efficiency and more. We headed back to our room, lit a candle on the balcony and fell onto the daybed to watch thousands of stars perform their flickering theater in the sky. After he was sure we understood the report, he gave guidance on how to reduce daily stress levels, as well as optimize our body’s ability to improve our overall well-being. The 30-minute session was quite eye-opening for both of us. Our morning continued in Preidlhof’s Med Spa & Beauty Center with facial treatments. Each session was individually tailored. One to reduce the signs of premature aging in men using specialized Spanish botanical extracts, and the other to induce deep regeneration of the skin through the 5 elements of nature, biorhythmic stimulation and a clay facial mask. We found both treatments sublime and recommend them if you’re interested in beauty care in addition to wellness. Splashing from pool to pool and taking in the radiance of the sun soaked up the rest of our morning. In the afternoon, we left Preidlhof for the first time since arriving. Hiking up to Castle Juval had been on our wish list ever since discovering it was a part of the Messner Mountain Museum. The hike was exhausting, but the historic haunt at the mountain’s summit combined with sweeping valley views made the adventure well worth it. A hike to Castle Juval is a must while at Preidlhof. Returning in the late afternoon the soulfulness of the indoor pool area caught our fancy again. We dropped in for a dip before enjoying our final 7-course dinner with a couple glasses of Vernatsch from Rebhof Kastelbell, another local gem from the Val Venosta / Vinschgau Valley. By the time we savored the last bites of dessert, yawns began to steal away the evening. The day had thoroughly worn us out. We headed back to our room, lit a candle on the balcony and fell onto the daybed to watch thousands of stars perform their flickering theater in the sky. A perfect romantic end to a stay we will never forget. Thank you Preidlhof and your amazing staff for hosting us during the lovely autumn season in Naturns! For tips on how to maximize your time at Preidlhof, check out our Preidlhof Tips page.